These days, flying is almost irredeemably difficult. From baggage fees to security lines, even the most zen flyer can experience Travel Stress at Airports (TSA). Luckily, there is a prescription. Airports offer oodles of thoughtful amenities, such as yoga rooms and therapy dogs, to help keep your nerves from becoming irreparably frayed. Click through for eight relaxing amenities and services that will make any time spent in the airport much, much better. San Francisco was the first airport to feature this soothing service, but multiple airports now offer a similar space amid the bustling terminals and snaking security lines (including Burlington, Dallas-Ft. Worth, Albuquerque, and Raleigh-Durham). SFO's yoga room has a calming blue palette and relaxing low lights, while Albuquerque's stained-glass meditation space helps flyers feel fit and relaxed before the madcap rush to their gates. So assume your best tree pose and BYO mat (they're surprisingly easy to pack), or simply drop by for a few oms before you jet off. Long gone are the days when airport food was limited to limp McDonald's fries or, if you were lucky, an Orange Julius. 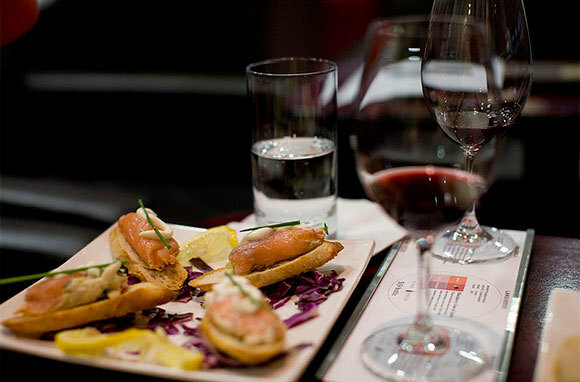 Realizing that flyers are quickly becoming gourmands, airports have begun offering award-winning wine bars that welcome slow sippers. Expect locally sourced fare and sommelier-curated lists of small pours (and nary a yellow wrapper to be found). A few notable bars include One Flew South (Atlanta's Hartfield-Jackson), with its extensive menu of 30-some vintages; Bubbles Wine Bar (Chicago O'Hare), which has a soothing jazz-club atmosphere and exemplary sushi; and the mini-chain Vino Volo, with 19 airport outposts in North America. The airport may not be a temple of beautification, but a chair massage or seaweed facial can certainly soothe the harried traveler. 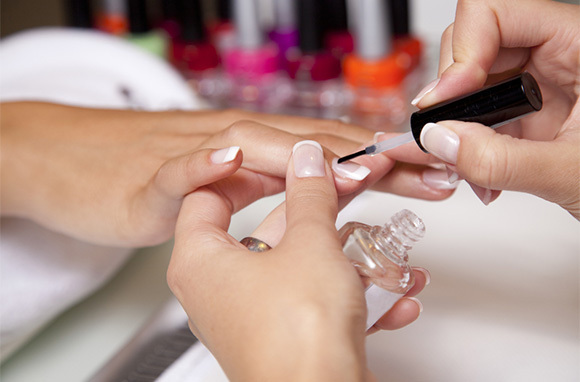 XpresSpa maintains a menu of 56 in-airport locations where guests can get quickie massages, facials, or OPI mani-pedis (the perfect antidote to five hours of enduring cramped cabins and lifting heavy bags). For a real luxury-spa experience, check into Elemis at London Heathrow, where first-class British Air passengers receive complimentary 15-minute treatments that use stress-reducing lavender and mood-enhancing rosewood. Getting a full night's rest isn't easy anywhere, let alone at the airport. Between loudspeaker announcements chiding the Johnsons for their terminal tardiness to the general chatter of fellow passengers, airport noise levels rarely allow much rest. To catch a few priceless Z's, check out nap pods in a number of airports (including Atlanta, Philadelphia, and Dallas-Ft. Worth stateside, and Abu Dhabi, Amsterdam, London, Munich, Beijing, Tokyo, and Moscow overseas). Configurations vary, but most offer a lie-flat bed in a private cubicle, and some even come with TVs or work spaces for relaxation options beyond snoozing. For further tips on getting some rest, read our roundup of tips for safe airport sleeping. The Wall Street Journal recently reported that airports are spending millions of public-project funds on major works of art, noting that they "see art as a way to calm and entertain harried patrons." 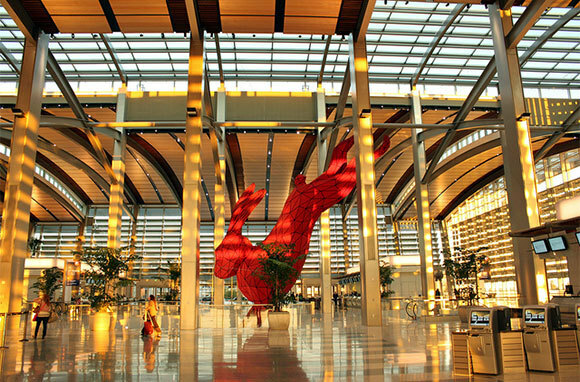 This means that terminals are getting prettier, and your layover is getting a little less boring. Explore exhibits like Miami's Harmonic Convergence, an interactive sound-and-light installation in a people-mover station, or Sacramento's 56-foot-tall rabbit sculpture by artist Lawrence Argent. Amsterdam's Schiphol even includes an entire mini-collection of Dutch masterpieces on loan from the Rijksmuseum; never again will your cultural education go lax in transit. Nothing makes travel less fun than that last-minute sprint to your terminal as you drag a wobbly bag behind you and lose your boarding pass, ID, phone, or all three. This is why we're gaga for airports that come with interterminal transportation (especially handy for quick connections). 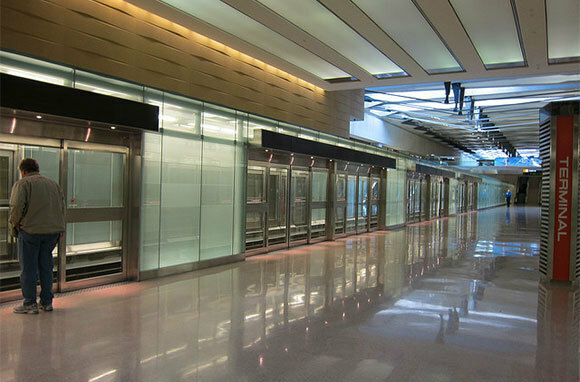 Atlanta's Plane Train, the most heavily trafficked automated people mover in the world, connects the Main Terminal with seven concourses in mere minutes. Similarly, San Francisco's AirTrain and Washington Dulles' AeroTrain connect passengers between terminals, eliminating the need for frantic dashes on foot. Check your airport's transportation services before leaving home and you'll never again risk missing a flight (or twisting an ankle). Travelers with little ones know that the biggest challenge at the airport isn't printing boarding passes or navigating baggage claim, it's keeping the kiddos occupied during long waits and layovers. Thankfully, many major airports offer children's play areas, leaving parents' hands free for a Starbucks latte (or several). 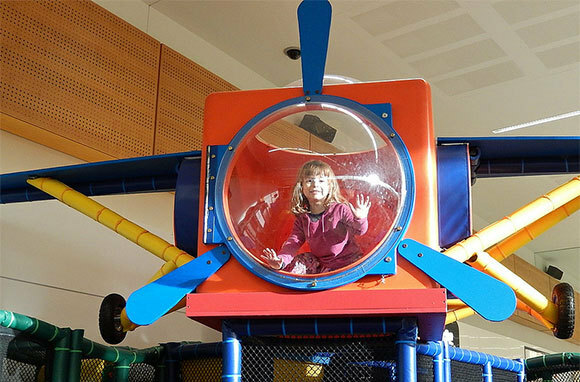 Check out Chicago O'Hare's and Boston's aviation-themed play places, where your budding baggage handler can sharpen his or her skills, or Portland's LEGO tables, for your experimental-architect-in-training. FamilyVacationCritic.com rounds up a list of the rest of the best airports for families and all the playground amenities they offer. And finally, our favorite airport amenity: puppies! No, really: Several domestic airports offer therapy-dog programs to alleviate airport stress, including Miami, Los Angeles, San Jose, Ft. Lauderdale, and, the newest addition, Grand Rapids' Gerald R. Ford International. 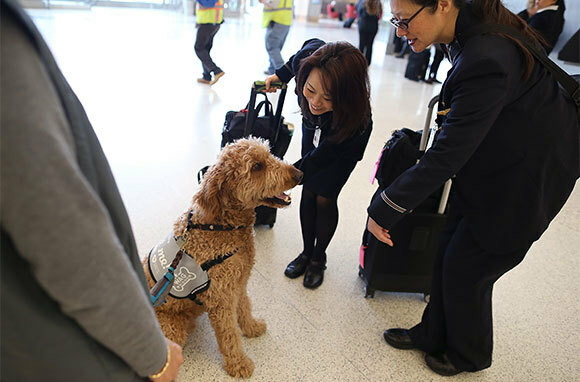 Certified therapy dogs and their human trainers walk the terminals and assist passengers looking to de-stress through happy pettings, belly rubs, and slobbery hugs. 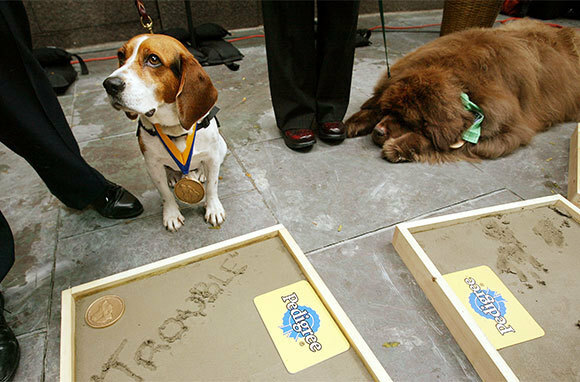 San Jose first introduced the puppy program in the days immediately following 9/11, when stranded passengers dearly needed a companion, but expect the program to be unleashed in more airports in coming years.